November is the perfect time to leave on my trip. Had I left in September as planned, I would have missed this magnificent fall and the satisfaction of all is well. I am one of those people who wake up in the morning with a million plans. 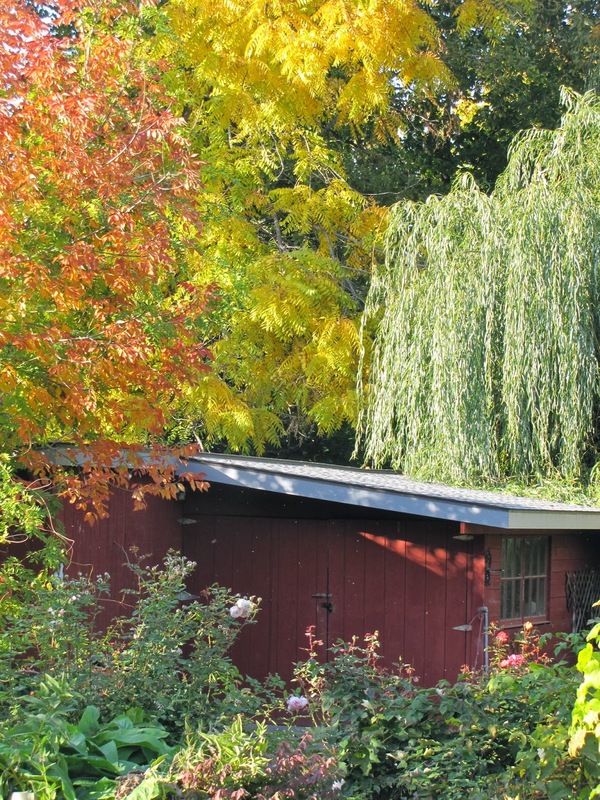 This quiet little shop surrounded by trees in my backyard has been the site of intense activity throughout this September and October. Before I left I wanted to have the shop a bit more tidy, the ceiling all insulated, and the kitchen cabinets for the house stained and up. The yard itself had an extensive list of work. Prune the raspberries and blackberries, bark the pathways again, tarp a couple of the rose beds and harvest the grapes. Turning the compost pile never made it on the list, partly because something was growing out of it that seemed to be doing well without any attention. A mass of leaves covered the pile and then extended down the brick compost path and off north into the neighbor's asparagus plants. As temperatures dipped and I began seeing what was under the leaves and realized that there was something worth harvesting! Surprise! 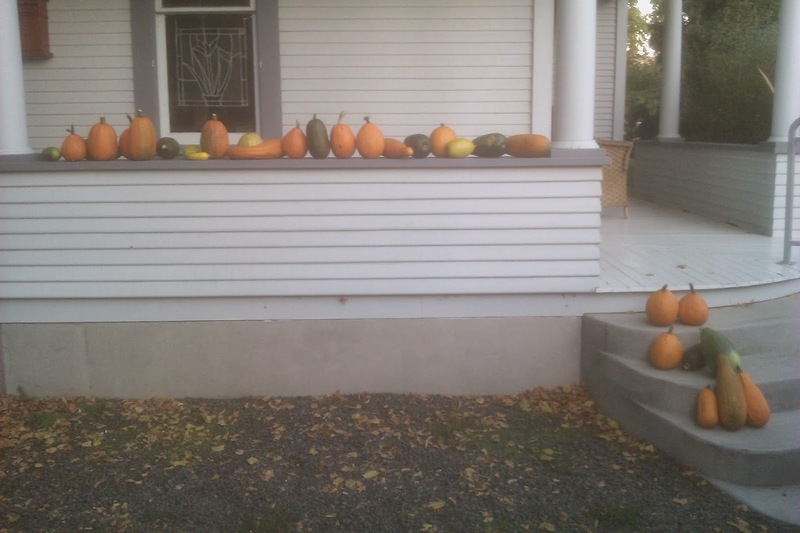 Twenty-seven members of the squash family of one sort or another! Now mostly gifted away. Back to the grapes. Although I live in wine country, my grapes are the ordinary concord grapes. Well not exactly ordinary. Juice made from these grapes in a good year rivals a good wine. As a recent guest commented this juice is like a good wine in that it has layers of flavor. The juice this year is extra rich and strong. Sometime I get fourteen to seventeen gallons of juice, but his year I only got about six. My grape arbor is not the usual grape arbor. The previous owner planted the arbor. It's tunnel shape has fallen over only once burdened by a record three feet of snow. It was rebuilt with locust wood harvested from windblown trees. 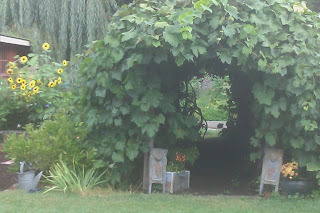 I so often try to get a picture of this arbor, but capturing its twenty-six foot length and seven foot height is difficult. The entrance looks like a hobbit hole. Children and adults are invariably drawn to the entrance. Wandering through its length breathing deeply of the tangy smell of grapes and noting the light filtering through the leaves is an experience that slows the step and delights the mind. I have traditions for making juice. I brew a good Earl Grey tea, fill a bowl with dark chocolate chips and gather some grapes. I sit in the fall cool air and remove the grapes from the stems, drinking tea and eating the chocolate and thinking. I would have missed this tradition if I had left in September. 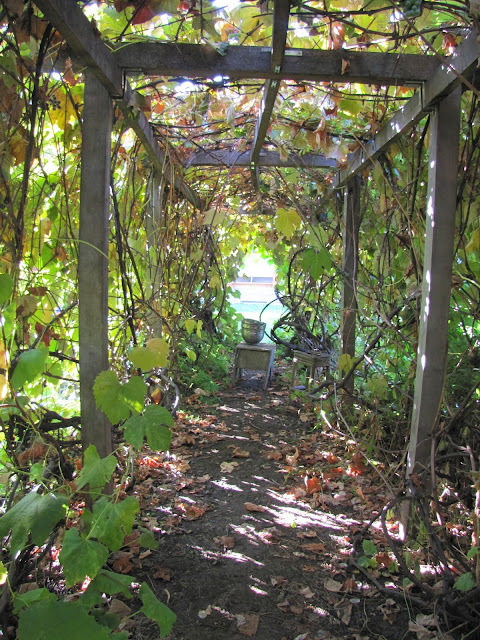 Great pictures of the grape arbor. You have an amazing arbor of grapes. I miss doing grapes with you this year but maybe next year. Have fun on your trip, Kathy. I usually get 14 to 17 gallons of grape juice. This year I only got about 7 gallons, but the juice is exceptional! Should have sent you some!